The Tatuaje Cojonu series is a triennial release by Tatuaje cigars. The series was started in 2003 and for the most part has resulted in a new release every three years (I’ll leave the Tatuaje Gran Cojonu as an exception). In each release year, there has been a different blend with a different vitola. The recent 2012 release cycle has actually produced two different blends with a third one scheduled to be released at the 2012 IPCPR trade show. In this assessment, we explore the 2009 release – the Tatuaje Cojonu 2009. This cigar proves to be a worthy member of a collection that has proven to be a favorite among many cigar enthusiasts. The name “Cojonu” is short for “Cojonudo”. Translated from Spanish to English it could be “helluva” or “ballsy”. Whatever the case, the name is meant to indicate that this is a bolder, spicier, and/or stronger blend that many other Tatuaje cigars. For each year the cigar was released, the cigar is named with that particular year (with the exception of the recent Cojonu 2012s as there are multiple blends). Let’s break down the Tatuaje Cojonu 2009 and find out a little more about this cigar and how it smokes. The Habano Ecuador wrapper has been a staple of the Cojonu series. It has appeared on on every release of the Cojonu series, including the Gran Cojonu. It is also scheduled to appear on the third blend of the Tatuaje Cojonu 2012 later this year. 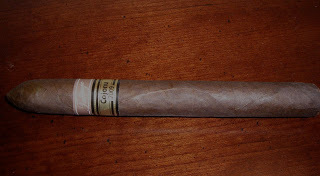 For the first three releases (2003, 2006, 2009) of the Cojonu series, only a single vitola was produced. For the Tatuaje Cojonu 2009, it is a 6 3/4 x 48 belicoso. The Tatuaje Cojonu 2009 has a classic chocolate colored wrapper. The wrapper itself is slightly oily. From a close examination you can see some dark spots. There are some visible veins, but overall I would not classify it as toothy. brown band. This band has a gold background with black font and striping. It says “Cojonu” in black font. Below that text it says “2009” in smaller black font. As many readers know, the straight cut is my trademark choice of a cut of cigar. In the case of the Cojonu 2009, since this is a belicoso, this is a default choice. After clipping the tip of my Cojonu 2009, I proceeded to start the pre-light draw. The dry draw notes yielded to me a mix of chocolate, leather, and some cedar spice. Overall, I considered the pre-light draw on my Cojonu 2009 to be satisfactory, so it was time to toast the foot and begin the cigar experience. The start to the Cojonu 2009 yielded a classic Garcia pepper blast to start. Since the Cojonu 2009 (just like about every Tatuaje) is blended by the Garcia family, the pepper was no surprise. The pepper blast settles quickly and the flavors settled to mocha and spice. Around the five percent mark, the mocha and pepper spice diminished and gave way to flavors of nut and earth with spice relegated to the after-draw. Around the one third percent mark, some cocoa notes marked a return and it moved even with the nut flavors in the forefront. The pepper spice still remained on the after-draw. By the midway point of the cigar, the spice picked and the flavors of spice, nut, and cocoa converged – fusing very nicely. This also created a very smooth flavor profile. As the Cojonu 2009 reached the last third, the spice moved into the forefront with the cocoa and nut following closely behind as secondary notes. This is the way the flavor profile held until the end. The end was still relatively smooth, despite being on the spicy side. The resulting firm was a little warm in temperature, but firm to the touch. If you have read articles by me on this web-site, you know I am not a fan of the belicoso. In a lot of cases, I feel a classic parejo will always provide a better burn and draw to a belicoso time and time again. This is the case with the Cojonu 2009. It provided a good burn and good draw – just not a great one. On my experiences with the Cojonu 2009, I felt the burn was a little uneven on the first half of this smoke – requiring many touch-ups. It was during the second half of the smoke where the burn seemed to straighten itself out. The burn rate was ideal during the smoking experience. With the exception of the warmer finish, the burn temperature was also ideal. The draw followed a similar pattern to the burn. On my experiences with the Cojonu 2009 the draw was on the tight side during the first half. It was only on the second half where it opened up and became more of what I consider an ideal draw. When it comes to the name “Cojonu”, I looked to the attributes of strength and body to see if it lives up to its name. From a strength standpoint, the Cojonu 2009 started out medium to full from a nicotine standpoint. By the last third, the Cojonu 2009 moved into full strength territory. As for the depth of the flavor notes, these were robust from start to finish. I assessed the Cojonu 2009 to be full-bodied throughout the smoking experience. There was excellent balance between the strength and body as neither attribute overshadowed the other. Despite some early issues with the burn and draw, the Tatuaje Cojonu 2009 provided a very good smoking experience. If this was a classic parejo, I do think this would have even been a better experience. From a flavor standpoint, there is no denying this is a solid cigar. I consider the Cojonu series to be one of the classic cigar collections out there and the Tatuaje Cojonu 2009 is still worthy of being a part of it. The Cojonu 2009 is a cigar I’d recommend to a more seasoned cigar enthusiast who prefers something stronger or fuller. I think this might be too much cigar for a novice cigar enthusiast. As for myself, I would reach for this cigar again. Source: The cigars for this assessment were purchased from Outland Cigars’ in Charlotte, North Carolina.